WHAT HAPPENED: After a Ky Bowman’s 3-pointer with 10:57 to go pulled Boston College to within 47-37, Tyus Battle scored 11 points during a 13-3 run that gave SU a 60-40 lead. BC was not done, responding with a 14-0 run to make the score 60-54 with 3:54 left after a Bowman 3. On SU’s ensuing possession, Battle’s drive past three Eagles defenders earned him a trip to the charity stripe where he stopped the run with a free throw. Syracuse would hit six more free throws from there, and Boston College could get no closer than six the rest of the way. ANALYSIS: Syracuse’s schedule becomes significantly more difficult after today. Boston College, ranked 137 in the NET rankings, represents a Quad 3 win since the game was played at home. Six out of SU’s next seven games are played in Quad 1 games, with the lone exception being a March 2 road game against Wake Forest, currently 195 in the NET rankings, which would make it a Quad 3 game. The Orange is now 8-3 in the ACC, and a 10-8 record would be a nice resume number heading into Selection Sunday. That means the Orange needs to take care of business against the teams they should, and the win over the Eagles on Saturday afternoon was exactly that. HERO: Credit the Syracuse defense for limiting Boston College and taking advantage of their mistakes. The Orange held BC to 33.3 percent shooting from the field and 6-19 from downtown. It also forced the Eagles into 15 turnovers which SU turned into 21 points (by contrast, Boston College only forced eight turnovers for two points). 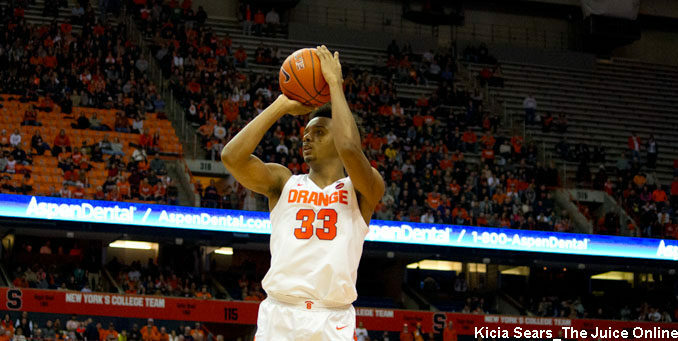 Battle was the biggest beneficiary, scoring 21 points on 8 of 13 shooting from the field to lead the Orange. Buddy Boeheim hit 4 of 5 3-pointers to finish with 16 points, a new career high. ZERO: Jordan Chapman and Nik Popovic combined for 6 of 21 shooting from the field for 22 points. Frank Howard continues his struggles for the Orange, with just three points on 1 of 9 shooting. WHAT’S NEXT: The Orange goes on the road to play North Carolina State on Wednesday, Feb. 13 at 8:00 p.m. TV: ACC Network.